I've told this story a few times and shared it with team mates on Facebook, and I had every intention of copying and pasting what I had shared, but for the life of me I can't locate the posts. 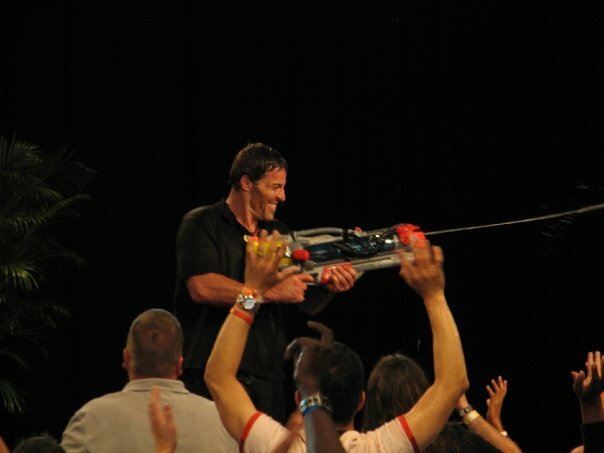 My husband has been a huge Tony Robbins fan since his early 20's. Me, not a fan, only knew he was some sort of life coach. I had seen his picture before and seen him in the movie Shallow Hal. My husband had caught wind that there was going to be an Unleash the Power Within in Toronto, just 3 hours from us. He was excited, but at the same time, questioned being able to go. He had just been called back to work a month or so prior after being laid off for those 18/19 months. So we were in some heaving repayment of late bills. Out of curiosity, he called to find out ticket prices. General admission was $999/person. That's more than a months mortgage payment. But stupidly, my husband was optimistic. We always got "junk mail" from Tony's organization and really, it just sat around and never got opened. Always some class or seminar in Fiji that we couldn't afford. So weeks were passing and its getting closer to the date. Agents are calling us now offering a lower price so they can fill the final seats left. The offer was $750. Still couldn't afford it. Another offer was called to us days later. We could both go for $499, not each, for both. Wow. Maybe this IS something we could afford. The fun part now! I'm sitting on the couch one night thinking I really need to clean up the junk mail. There sat a Tony envelope. I figured, I'm going to open before I toss it. You'll never guess what was in it. Actually I didn't even know what they were at first. 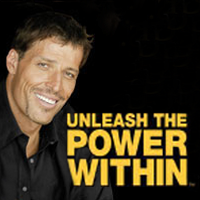 Two VIP tickets to Unleash the Power Within. $1299 tickets. I showed them to my husband so he could confirm if they really were tickets as he's been to an Unleash the Power Within once prior. They were tickets. Real tickets, that sat there for weeks, through all the phone calls, the hope, the questioning where we were going to come up with the money to go. We somehow knew we'd get there. But instead of sitting behind 1000's of people in the back, we were in the VIP section sitting 12 rows back. Now the big question is, how did we get these tickets sent to us? We have no idea. No one has ever said they helped us. But someone did. And it was life changing. That was in the summer of 2009 and we have always looked back at the MANY wonderful things that have happened to us in that year and into 2012. Tony lit the fire! Our fire has fizzled a bit, but we have the tools and we just need to take a moment to apply them again. It was an amazing experience that I got to share with my husband. I got to walk on fire. I got to meet some great people. An experience I will never forget! what a brilliant post. You must have been blown away at finding those tickets. Can't even explain the disbelief. Who ever did that for us, I will forever be grateful for. Wish we could thank them. Tony can do that, can't he. I've never been to see him in person but I've listened to some of his tapes. I really got moving on a business after listening to him. He's a great motivator. When ever my husband needs a little pick me up, he puts on Tony Robbins. I really enjoy Tony's messages and love what he's doing for people. He truly is a master with an amazing gift! Great post Shannon! I love this story, and would like to hear more about the event and how it impacted you. It was an amazing 3 day event. Started on Friday and mostly focused on getting us ready to walk on fire later that night. An inner monologue needed to be created. Yes! Yes! Yes! Day 2 got into the root of a lot of things that can hold us back. I still sometimes go back and look at the work book. Like a reminder of what I need to do. And then it went into financial stuff. Day 3 focused on nutrition and things like that. Over the next year we were able to fully recover from almost losing the house to being way behind on the mortgage (hubby was out of work for 1.5 years, I went back to college, we got engaged, then got married, then had a baby. Just so many great things for well over 1.5 years after.